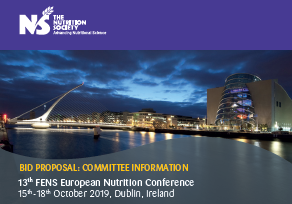 We are delighted to announce that The Nutrition Society have won the bid to host the Federation of European Nutrition Societies (FENS) conference in 2019. The 13th FENS European Nutrition Conference will be held between 15 – 18 October in Dublin, Ireland with ‘Malnutrition in an Obese World: European Perspectives’, the proposed theme. Keynote PCO look forward to working closely our client committees to deliver a world class conference.